The Cidco Exhibition Centre, Navi Mumbai was transformed into a massive designers’ and creators’ hub for Autodesk University India 2016. The event was the center for all media professionals in India as well as globally to exchange knowledge and share their own creator and design stories. 4000+ makers, architects, engineers, creators and designers took part in the event. The theme of the event was well encapsulated as the “Future of Making Things”. The breakout sessions following the main session included Manufacturing, Media & Entertainment, Architecture Engineering & Construction and ID & V. Red Chillies Films and Yash Raj Films held sessions on the VFX making for the movie Fan and Sultan respectively in the Media & Entertainment session. The first Maker Auto was launched at this event. This auto would be used train students across the country to effectively use technologies such as 3D printing and various other techniques of creation. Spread across two massive buildings, the entire centre was divided into 6 parts for Registrations, dining, Partner exhibit area, Plenary sessions, India Maker’s arena and Breakout sessions. These five Breakout sessions were held by the customers, partners and employees for all those who aspired to enhance their skills and possibilities. 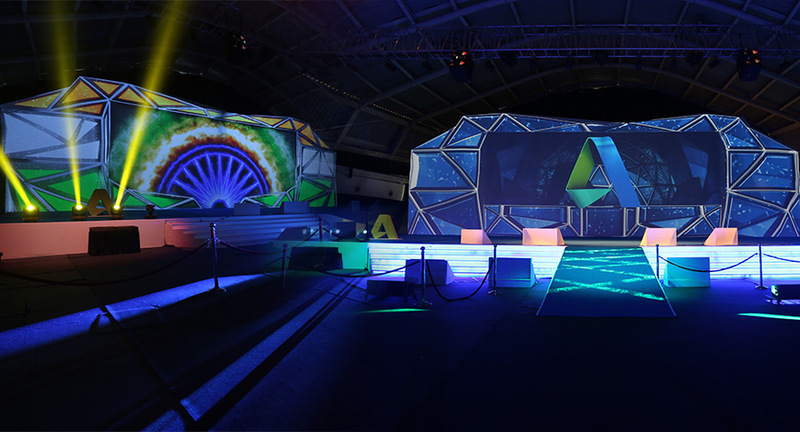 The event organisers took up the challenge of 3D mapping a set that was 84 Ft in width and a whopping 30 Ft in height. With multiple technologies in place such as 3D Printing, laser cutting, Virtual reality and many more, the attendees were treated to a visual and experiential treat. The two main speakers for the evening entered the stage on a segway and an open jeep with Bollywood Dancers to create a visually appealing and dramatic entrance. Sound.com provided the sound system at the event. Warren D'Souza, Founder, Sound.com stated “Delighted to have collaborated with Laqshya Live Experiences for Auto Desk 2016. Hoping to kill it again next year”. The Principal Secretary of Industries, Govt. of India, Mr Apurva Chandra inaugurated the event. With the entire country on the wave of Make In India, Autodesk University set the benchmark for the Design In India space with multiple technological advances displayed here. Branding opportunities such as Atmosphere Balloons, 3D Letter Cuts, City Wide Hoardings and many such clutter breaking mediums were used to take the event much more commercial scale. Social media was abuzz with #AUIN16 trending in the Top 3 in India and Shahrukh Khan posted tweets showcasing his interest in attending the event in the years to come.